← That’s No Ordinary Rabbit Cookie! This post is going to involve a lot of unhealthy but delicious food. Think diner food. Yum, but probably lethal. WARNING WARNING WARNING PART 2! This post does not include a recipe. It includes mention of ingredients and how I made something, but I didn’t measure anything. Because really, you’re all going to substitute your own preferences anyway. 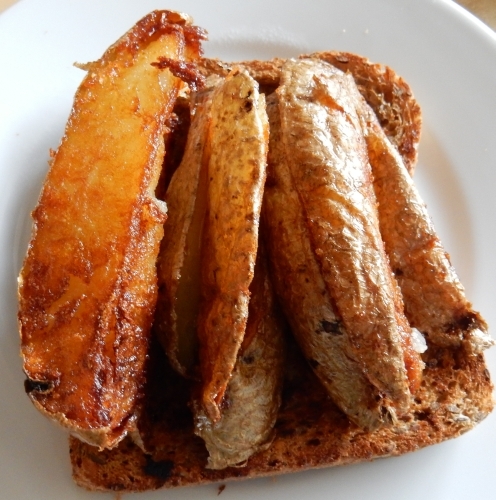 Think of this as an inspirational bit of food bloggery rather than a specific how-to. WARNING WARNING WARNING PART 3: RETURN OF THE JEDI-KING OF SANDWICH! This post is using “poutine” in a very loose sense, in that cheese curds are not something I regularly keep in my fridge. I know that proper poutine involves curds. I am Canadian, after all. 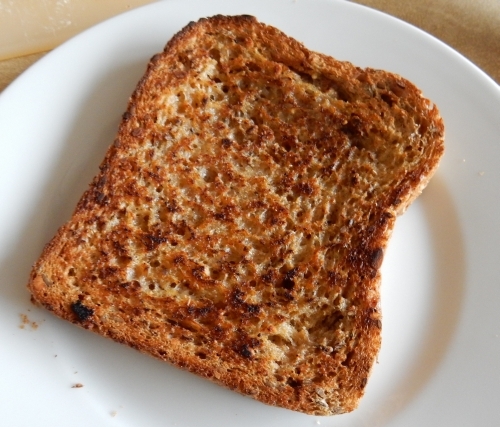 And it’s not really a grilled cheese sandwich, but more the elements of such a thing arranged in a different way. But we’re all going to pretend that my chunks of cheddar are good enough and that it’s grilled-cheese-ish because pedants get no sandwich. Right then, is everyone ready to salivate? Because I made something awesome for lunch a couple of days ago and as proof of how much I love you all and hate your arteries, I want to share it with you. Well, the photos and how-to, not the actual sandwich. THE SANDWICH WAS MINE ALL MINE. In fact as I described what I was going to make, my husband said to our eldest daughter, “Peo, it’s time to leave Mum alone in the kitchen for awhile so she can have some very special private time. Ignore any strange sounds you may hear.” Because we have real family values. Ohhhhhhhh yeahhhhhhh. Whoops, those are the strange sounds everyone’s supposed to ignore…. So here’s what happened…I stumbled across this video by the great Alton Brown about grilled cheese made on an actual outdoor grill. But I didn’t have access to one of those immediately so I went a’Googlin’ to see what else the world had to suggest for varieties of grilled cheese. I found a post about bacon grilled cheese by my good friend Terry McNeil wherein someone mentioned poutine grilled cheese. I Googled for recipes on that and found dozens, but being familiar enough with poutine since I went to university in Ottawa where it is consumed regularly as student fare, I figured I could make my own version from what I had around the house. I also wanted some mushrooms in it because mushrooms are delicious. And onions because if you have mushrooms you need onions. That’s the law. And I happened to have both in frozen, prepared form in the freezer, so I knew this would be a fast route to Yum Land. I grabbed a potato (specifically, a Wilja from the farm store down the street because these are the best potatoes I’ve ever had for making fries) and scrubbed it under a cold tap, but didn’t peel it. I then put it on a plate with some water and microwaved it for three minutes, then turned it over and microwaved it for three minutes more. 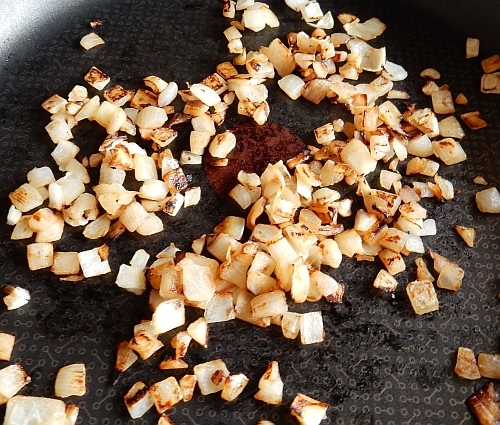 Meanwhile, I put some frozen onions in a pan lightly spritzed with oil and started browning them. When the potato was microwaved enough to be slightly softened, I carefully cut it into wedges. 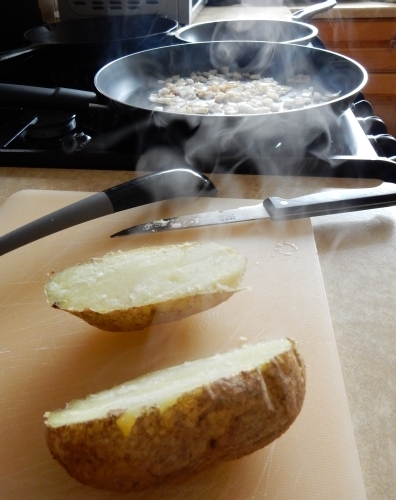 There is a reason for those songs and games about hot potatoes. Be careful! 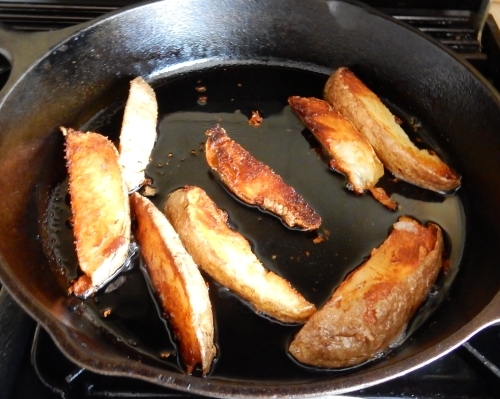 I put the wedges in a cast iron pan with a thin layer of canola/rapeseed oil and began frying them. 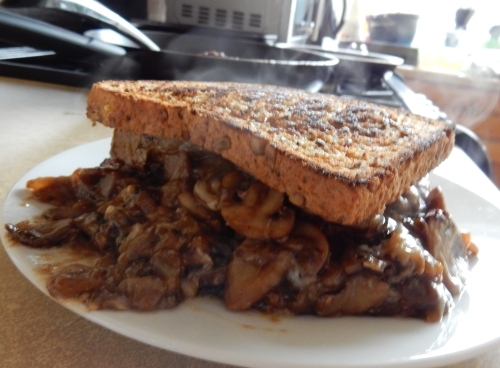 When the onion was brown enough, I added some frozen, pre-sliced mushrooms. Obviously you could use fresh ones if you have some, but I really like having these frozen ones on hand for random and sudden need of mushrooms such as this. When I say I browned the onions, I mean it. I really like the flavour of darkened onions. 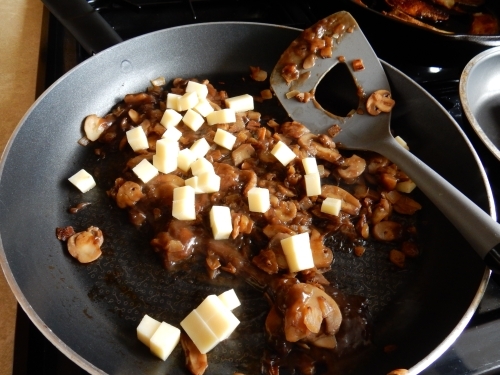 And the mushrooms will release their water and bring up all of that delicious fond from the pan. 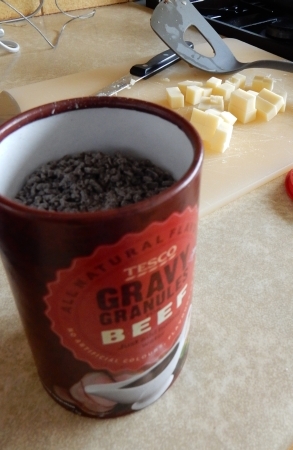 While the mushrooms started cooking and while also keeping an eye on the chips in the other pan, I mixed up some easy beef gravy with about a half cup of boiling water and a couple of scoops of these Tesco beef gravy granules. I told you this was like diner food! And as you can see in the background of that photo, I also chopped up a chunk of sharp cheddar into cubes. 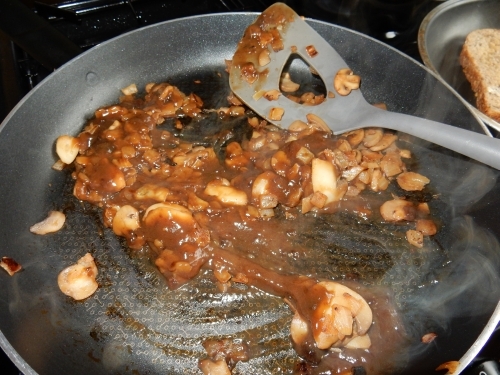 Once the mushrooms were getting tender, I added the gravy to that pan and mixed it all around. 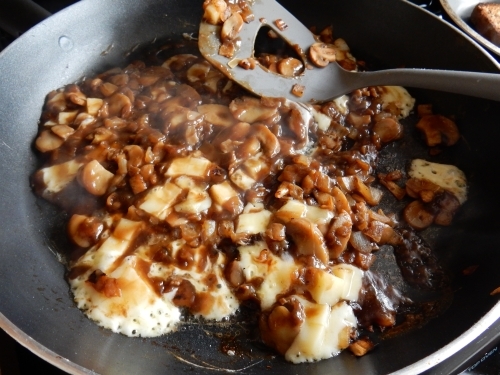 Onions, mushrooms, and gravy. So much yum, so not photogenic. While those came together, I flipped the chips over in the cast iron pan. This is the part inspired by Alton Brown insofar as making a pre-griddled cheese mixture to put on the sandwich. This made the cheese gooey in some places and frizzled in others. Uh oh, here come some more of those noises everyone should ignore…mmmmmm….ohhhhhhh…. Meanwhile I used yet another pan to fry up some bread that had been buttered on both sides. I then set the first slice on a plate. It’s whole wheat bread with seeds in it so there’s your health-washed content for this blog post. Also: delicious. Oh dear deity would you look at those golden, hot, crispy rods of drooltastic deliciousness?! 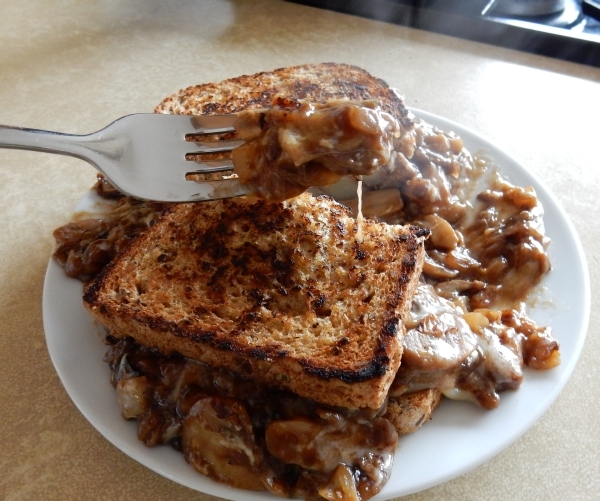 I put all of the mushroom-gravy-onion-cheese mixture on top, then put a second both-sides-fried slice of bread on top. 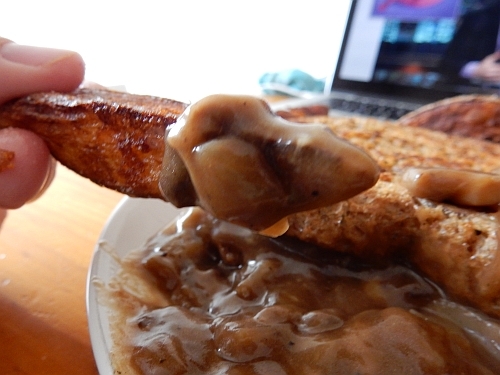 As a writer of romance novels I’m very familiar with steamy scenes, but this is the first one I’ve written that included mushrooms and gravy. That was about when I realized this wasn’t going to be a pick-up sort of sandwich, and a fork would be required. This whole thing was delicious. I highly recommend it. But there was a slight downside in that putting the chips on the sandwich did sacrifice their crispy edges. 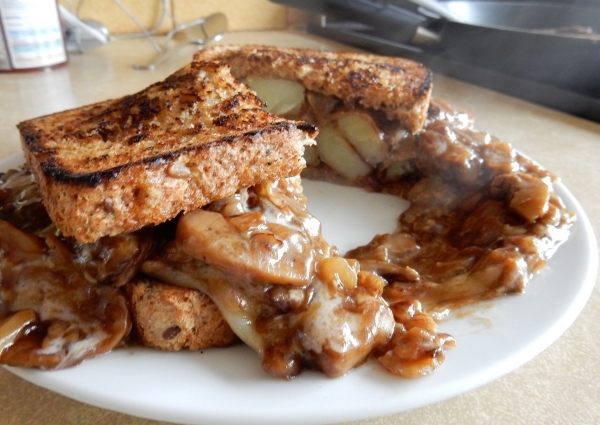 And then I discovered that not only does this give you the bonus of keeping the chips crispy, but you can use them as utensils to scoop up the mushroom-cheese-onion-gravy spillage from the sides of the sandwich. All this yum plus catching up on John Oliver’s show in the background. Happy happy day! Not a bad Easter Sunday morning! Happy Easter to everyone out there, and enjoy your own tasty treats today. I recommend making adorable and/or killer bunny cookies with your family. 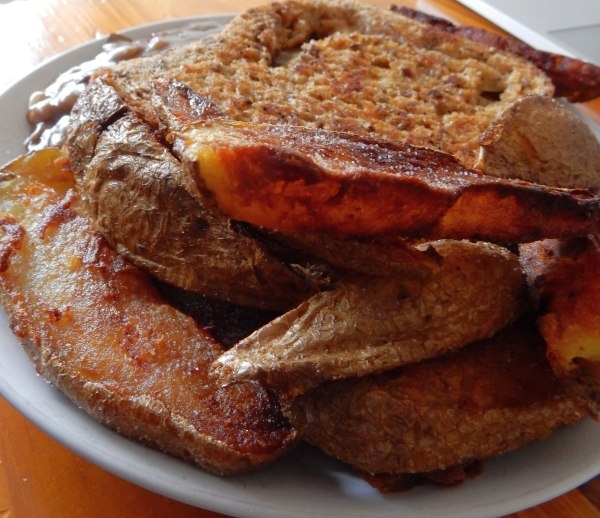 This entry was posted in Breakfast, Links, Lunch, Other Food, Other People's Recipes. Bookmark the permalink.